Stepping off the plane in Beijing, we already felt the difference from Guangzhou in the dry and chilly winter air. Not a trace of humidity in this city that hadn’t seen rain or snow since October. We were stunned at our good fortune as we stared at an ice blue sky, no clouds or smoggy haze in sight. 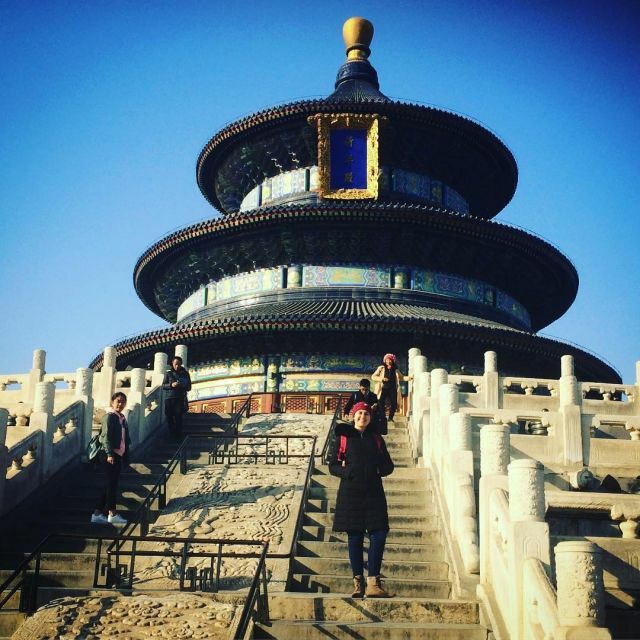 It turns out that right after Chinese New Year is the perfect time to visit Beijing, the tourist sites emptied out of the crowds that, just a week before, were filling up all the popular attractions and restaurants. Since we arrived in the mid-afternoon, we didn’t have much time to explore on our first day. As we dropped off our bags at our friends’ apartment, we found a note from them welcoming us to the city and promising to catch up later once they were back from work. They included a list of easy to reach sites to see in the couple daylight hours we had remaining. 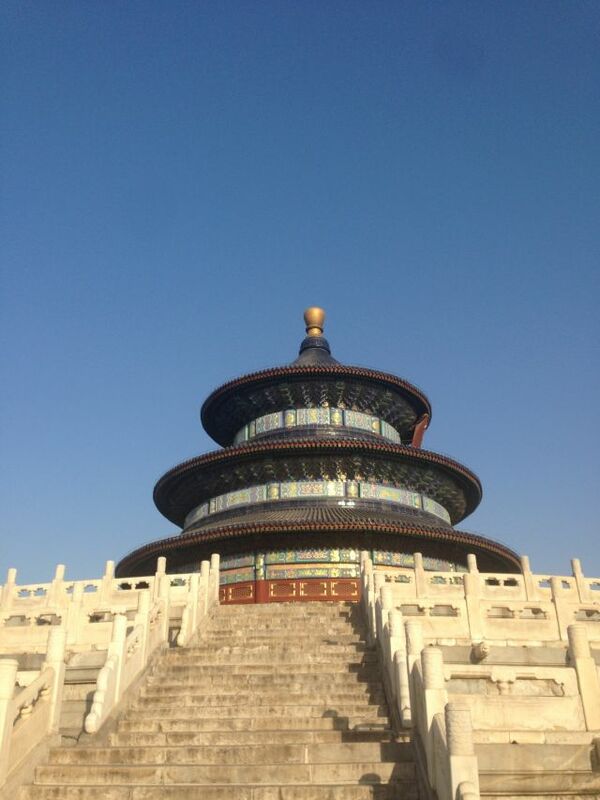 We made a quick plan to visit the Temple of Heaven before heading to our highly anticipated Beijing Food Tour. It is such a luxury to arrive in a city and brainstorm which internationally renowned site to visit first. Kids in a candy store, we called a DiDi (Chinese version of Uber) and headed off across the ancient city. Used to Guangzhou’s towering high rises, we were surprised by the low-to-the-ground buildings that made the large city seem smaller and less intimidating than I expected. Beijing restricts building heights around the city center to avoid obscuring the glittering Forbidden City. Our DiDi driver announced we’d arrived, his guttural Beijing accent sharp and thick in our ears more accustomed to lilting Cantonese. 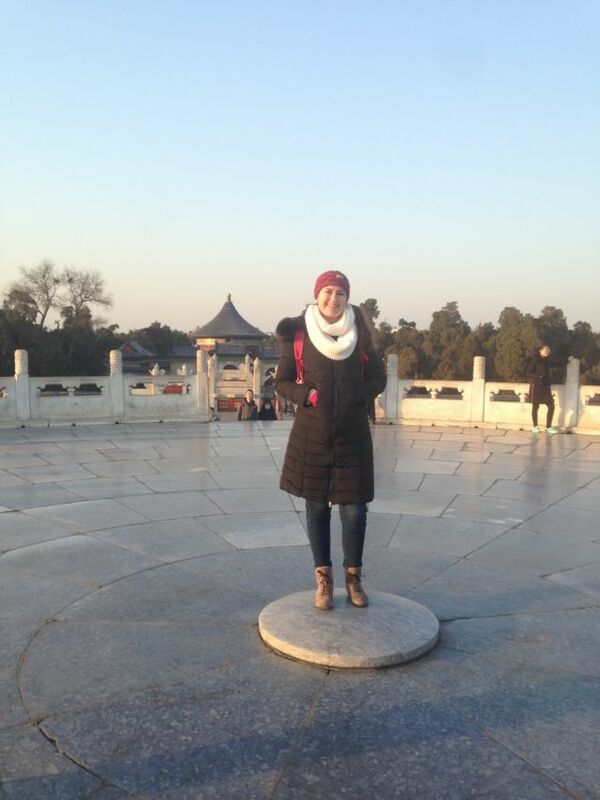 All of Beijing was a contrast; it was impossible for us to avoid making comparisons between home and the capital. The sun was already beginning to cast a golden light over the Temple of Heaven complex, perfect for pictures of the site where emperor after emperor worshipped Heaven across centuries and dynasties. While walking around the complex, I learned more about the Chinese concept of Heaven, which has appeared in several periods in Chinese history, as far back as the Shang Dynasty, and in different religions and ways of thought including Taoism, Confucianism, and Buddhism. Essentially, the Chinese concept of Heaven is a supreme source of good that rules over human endeavors. I won’t attempt to explain it much more than that given my meager understanding. Suffice to say, it played a central role in Chinese society especially as related to the emperor’s power and right to rule. We walked through a park filled with evenly spaced trees, branches gray and bare in the winter cold, and through the Long Corridor to the Hall of Prayer for Good Harvests. It was our first glimpse of the impressive imperial architecture that would continue to awe us throughout our time in Beijing. 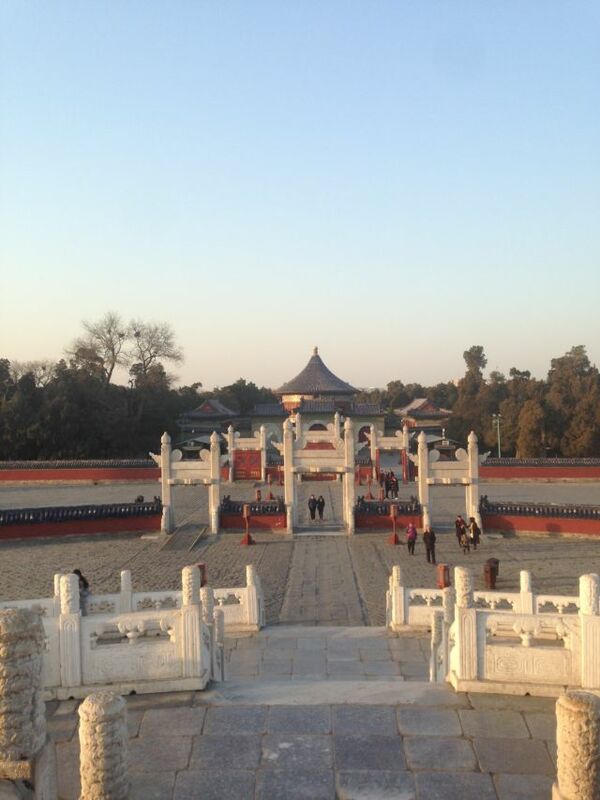 After wandering around the Hall and taking photos in the setting sun, we walked along the path the emperor would have walked to get to the Circular Mound Altar. After a couple hours, we walked back to the entrance to take the metro to our next stop, our Beijing Food Tour through Lost Plate. At this point, I have to apologize profusely that modern technology does not yet allow you to experience the tastes and aromas of our culinary adventures. Food is love. 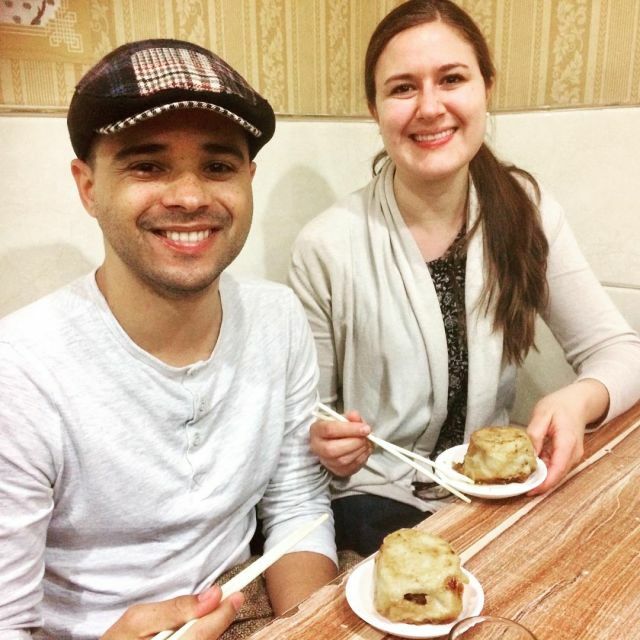 And Lost Plate Food Tours demonstrates that to its fullest, sharing their love for China’s diverse foods and cities through small-group tours with knowledgeable, enthusiastic guides. All of the destinations on Lost Plate’s tours are local, family-run restaurants that tourists could never find on their own. They also have tours in Chengdu, Xian, and Shanghai, so if you live in or travel to any of those cities, go find them and come hungry. Come hungry we did indeed, with bellies hangry and ready for the five restaurants promised to us. We met our guide Hong and two other guests outside the Lama Temple Metro Station. Our co-tourees were two friendly women from Brazil who were so easy to spend time with- fun, personable, and, like us, in love with food and travel. One of them lives in Xiamen and the other is a travel consultant and writer. Check out her blog Psico Promundo, especially if you’re a Portuguese speaker. Our group formed, Hong gave us a brief introduction to Lost Plate and then walked us over to two waiting tuk-tuks complete with warm blankets to ward against the cold. We rushed off into the Beijing rush hour traffic, zipping past larger and slower vehicles and then into the tight streets of Beijing’s historical hutongs. Modernization has unfortunately wiped out many of these older, traditional neighborhoods of gray, brick buildings, but many protected enclaves still exist in Beijing’s old city center, surrounding the Forbidden City. Lama Temple borders a large thriving hutong filled with hidden restaurants down narrow streets inaccessible by car. 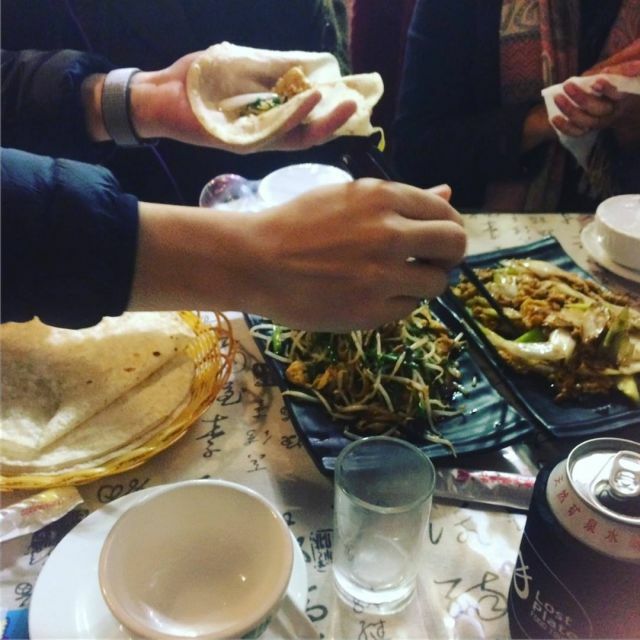 We pulled up to our first stop and extricated ourselves from our coats and winter gear as we walked into a small, steamy restaurant filled with people devouring noodles. We squeezed into a corner table, perching on small stools and looking to our guide for our instructions. 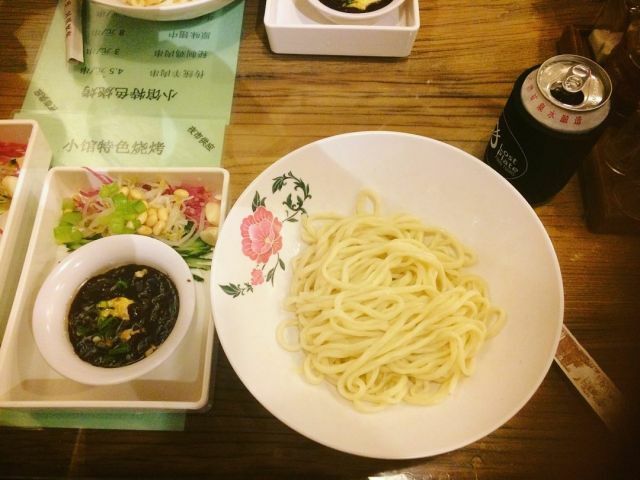 Each of us received a plate of plain, thick-cut noodles and a plate with different ingredients: black sesame paste, radish, cucumber, and bean sprouts. 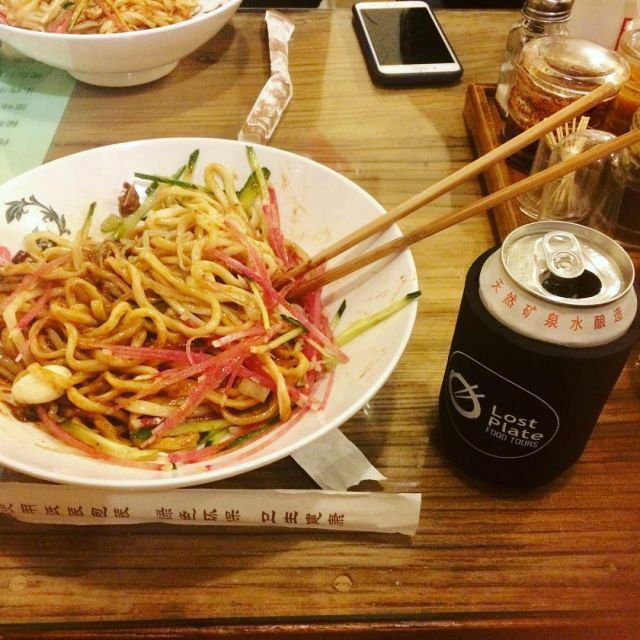 We then mixed these ingredients into our noodles and tried our best to not eat the whole delicious concoction, knowing there were more four restaurants to go. 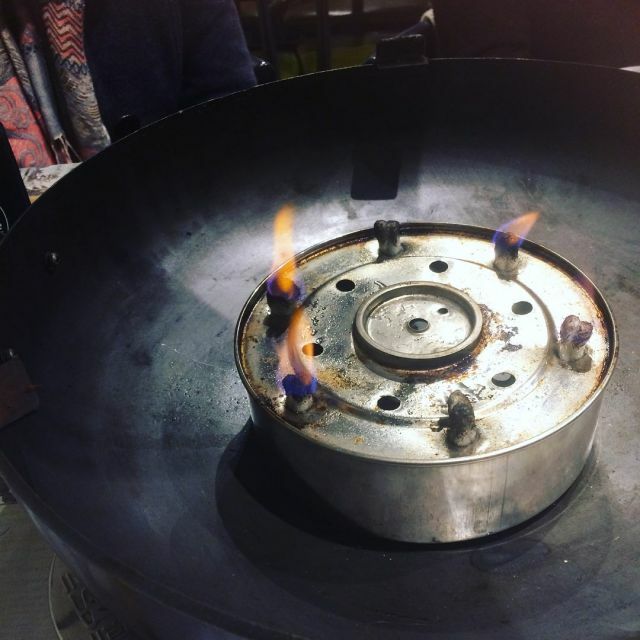 Seeing we were about done, Hong paid the bill and then whisked us back out into the cold to whizz away to our next stop, a Mongolian barbecue restaurant. Hong grilled lamb, eggplant, and mushrooms on a round grill on our table. He warned us not to eat the mushrooms until they were fully cooked, otherwise we’d be stuck to the toilet the next day. 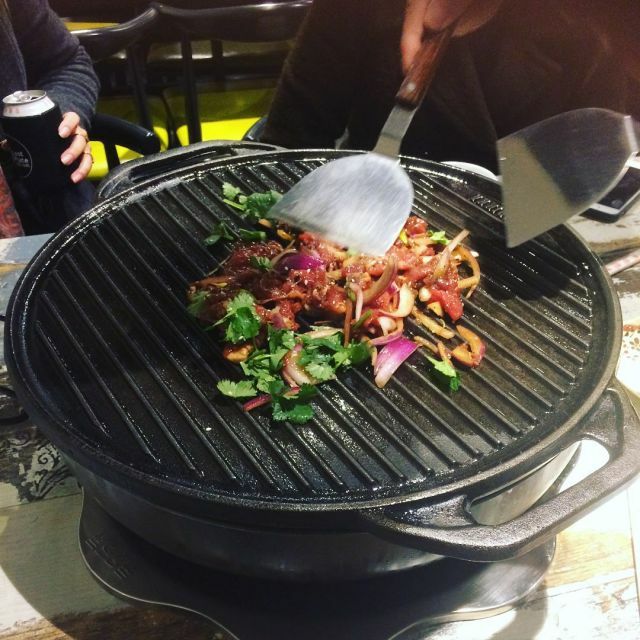 Jokingly, he asked if we knew what Mongolians traditionally used as fuel when grilling. “Poop!” Amaury loudly answered to our general amusement. He was right, but Hong was looking for the more technical term- horse manure. Full of noodles and now barbecue, we headed off for our next stop, chatting with Hong along the way about his background as an environmental economist. Looking for a career change, he had applied to Lost Plate as a part-time job as he did some career soul-searching. Our next stop was a Muslim restaurant with delicious food from the North West of China. Hong had warned us, but we were still surprised by the loud atmosphere in the restaurant, which was filled with smoke from the kitchen and cigarettes. People leaned over their tables yelling across their food to make themselves heard above the din. I would define it as a happy noise though. We nibbled at some seasoned peanuts while waiting for the main event, these huge dumplings called doornail dumplings. Apparently, according to Hong, the imperial kitchen would cook the emperor over 100 dishes of which he would eat a spoon from something like 68 of them. One evening, the chef had accidentally only made 67 dishes that the emperor wished to eat, so he quickly concocted a new dish with this dumpling. The emperor loved the dish and asked its name. Put on the spot, the chef quickly dubbed it a “doornail dumpling” because it resembled the golden doornails on the red doors of the Forbidden City. Whatever its name, it was delicious. The outside was a thick doughy pastry with the bottom fried and the top boiled. Inside was a juicy meatball that reminded me of the albondigas Amaury’s mother makes for us when we’re home. 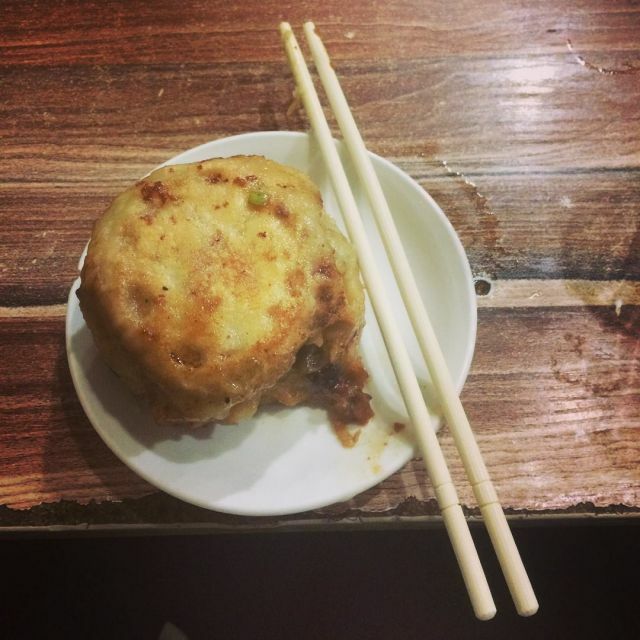 In flavor, the overall dumpling was reminiscent of an English meat pasty. How funny to feel nostalgia when trying a dish I’d never heard of or tried before. 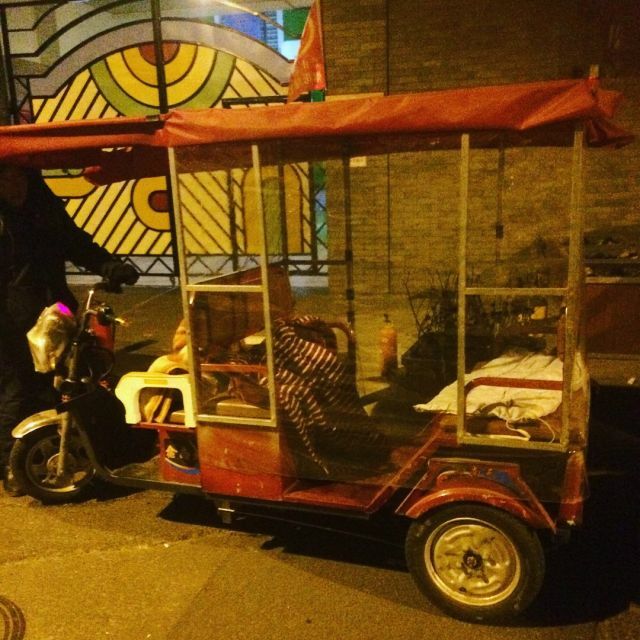 Our next stop was a bit further away, so we wrapped up warmly in the tuk-tuk and let our food settle. In contrast to the doornail restaurant, the next place was a quiet, empty restaurant nestled in the middle of a hutong. The owners ran the restaurant out of their own home and courtyard. The evening was getting on and we were their last guests before closing. Here we ate my favorite dish of the evening, homemade spring pancakes that we filled ourselves from dishes of fried rice with egg, vegetables, and kung pao chicken. These delicate pancakes take a long time to make, so most restaurants order them pre-made from factories. This restaurant makes them daily by hand, and we could taste the careful attention to detail in the scrumptious home cooking. Full and relaxed, we mosied out of the hutong and took a short ride to our dessert stop, a creative restaurant that mixes yogurt with red bean and rice wine. It was a bit of an acquired taste and not necessarily something I’d order again, but a fun way to end our eating. Apparently, the owner started out making it for her friends and family who liked it so much that she opened up a restaurant below her apartment. 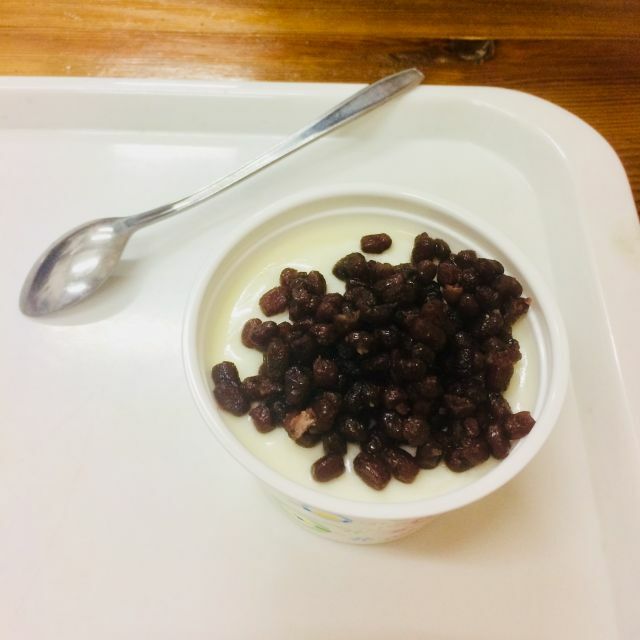 She orders the milk from local sources and makes the yogurt on site. 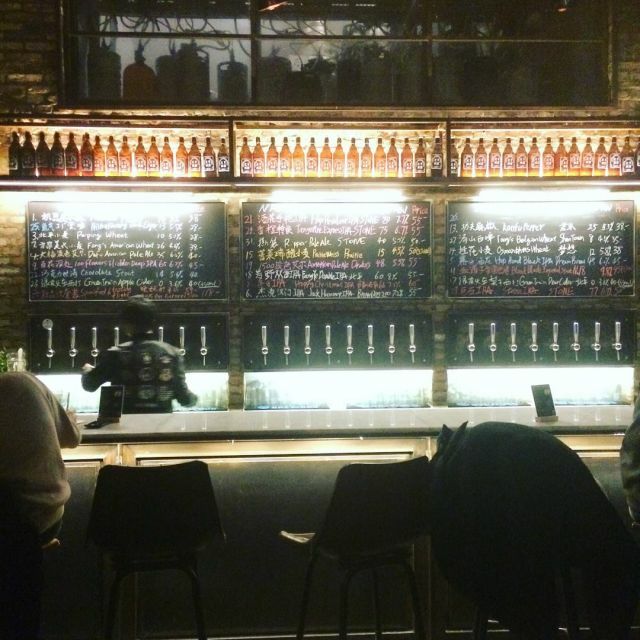 Our final stop was the Peiping Machine Taphouse for some local Beijing beer. I was pleasantly surprised that they also brew their own cider. I can never resist a good cider and this one was light, dry, and crisp with the taste of apples, just the way I like it. We sat around with Hong and our new friends chatting about international travel, language, and, of course, food. We were in food heaven.